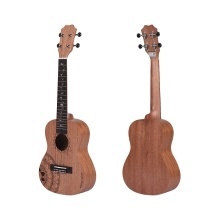 23" acoustic concert ukulele, a great musical gift for string instrument lovers. Mahogany veneer top board with decorative carved flower patterns, plus mahogany plywood side & back board. Okoume ukulele neck, rosewood fingerboard with inlaid flower patterns, and open type tuners design. High-quality Worth BE strings produce really nice and bright sounds. Comes with padded carry bag, uke strap, extra strings, clip-on tuner, cleaning cloth and celluloid picks. The color of the tuner, uke strap and picks will be sent randomly.